ABC Toys and Crafts November Challenge~Christmas Card! For my card I used this DARLING image from Stampavie~Penny Johnson called I Wish. I stamped her with Memento Tuxedo Black Ink and colored her with Copics. I then cut her out with Rectangle Nestabilities. The dp I used is Echo Park Paper Co. Season's Greetings and the sentiment comes from the PTI set Tree Trimming Trio. The layout is the November Jen's Sketch For You To Try. The prize for this challenge is $20.00 Credit to the ABC Toys and Crafts Store!!! 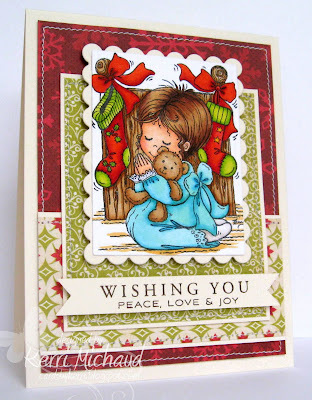 Just link your Christmas card to the ABC DT Challenge Blog HERE! I hope you have a wonderful Sunday! I have some major cleaning to do~so fun, right? Thank you so much for stopping by! So rich and gorgeous! I love it. But of course I love everything you do. I'm pinning this and others on Pinterest! Such sweetness! I recognized the sketch right away - great take! Beautiful card and amazing coloring, as always! LOVE this card...just the perfect image for Jen's sketch! Better thee than me (cleaning), though I really should have cleaned instead of stamping. BUT...had to get another DD card done! :-) Our man raced pretty well at Texas...#6 isn't bad for a track he hasn't done well at in the past! Have a good week, Kerri! Beautiful card, so lovely! What a cute image and your colouring is great. Kerri I love, love, love this card. It's so darn cute!!!! How can make this cards so neat ,I like your cards samples and i recognized the sketch in right away!! !